pm me in the morning. I have a link for WW1 Stuff. "Since battle and service clasps could only be worn on the full-sized World War I Victory Medal, 3/16 inch bronze service stars were authorized for wear on the award ribbon. 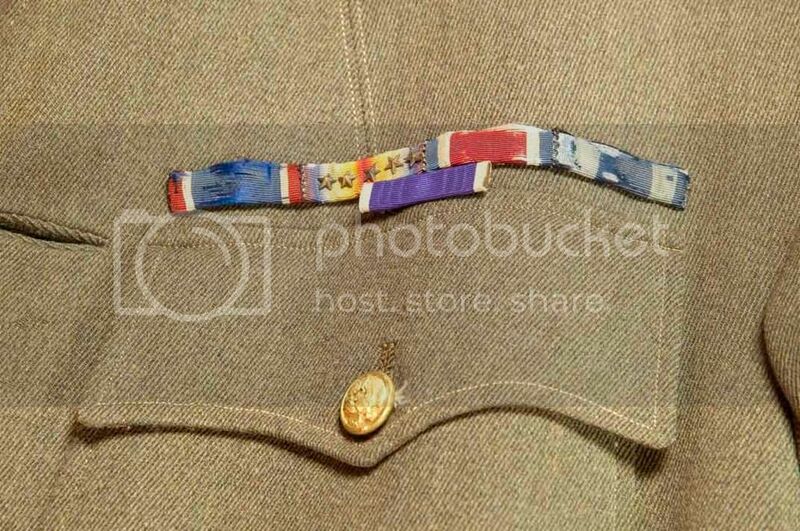 This was the common method of campaign and battle display when wearing the World War I Victory Medal as a ribbon on a military uniform." Looks like your stud was from New York. Good for you for putting this together for them. We keep these guys alive this way. Their stories are now ours to tell for them since they cannot. Never Forget. Hats off. As I understand it, if you got five medals in WWI, you were a serious stud. They didn't have multiple campaign medals, the volunteer medal, and a ribbon for every day served overseas back then. yes. The US was in WWI for one year entering in 1917 to 1918.
unlike other countries from 1914 to 1918. Wow. I just googled Chamberlain's title, and this was the first place I checked. Pics of his full uniform. Here is a great link with WW1 Medal information/photos. Thank you gents! Capt. Ward Chamberlin was indeed from NY, which explains the two on the right. Next stop is Dept of Military and Naval Affairs in NY, to see about replacement medals. 307th Infantry Regiment, 77th Division, A.E.F. The Distinguished Service Cross is presented to Ward B. Chamberlain, Captain, U.S. Army, for extraordinary heroism in action near Merval, France, September 15, 1918. While leading his company in attack through terrific shell fire, Captain Chamberlain was severely wounded in the right hand, this wound rendering his entire right arm useless. Despite his weakness from loss of blood, he refused to be evacuated until forced to do so. Last edited by namor; 13 August 2015 at 10:59. I started this in 2015, and was pleasantly surprised that the State of New York responded quickly with replacements. The US Army has not answered a single request in the intervening 2 years however. 4 months ago I asked my congressman for assistance with the Dept of Army, as of today he says I still need to get an official copy of the citation in order to for him to make a request to them. Guess who you need to ask for the official copy? The guys who haven't replied to 2+ years of written requests. The US Army has not answered a single request in the intervening 2 years however. Guess who you need to ask for the official copy? The guys who haven't replied to 2+ years of written requests. I don't know why they told you that. You need to go here to the National Archives and download and then fill out the Standard Form 180 to request his records. That should get you the citations. What is it specifically that you want, and who are you contacting, specifically. PM me if necessary. Good news - today we received confirmation that duplicates of all of Ward's medals are being shipped to us. Incredibly, the NPR center's records indicate that he was also awarded a Silver Star medal, and a new one will be included in the package. I guess he didn't feel the need to wear that ribbon along with the others. I need to give a hearty Bravo Zulu to Armitage12, whose assistance in this was indispensable in getting a successful result. I'm happy that I was able to help get the ball across the line. It should make for a wonderful display!